I am happy to pull from the archives this behind-the-scenes story about the making of Layla, an undisputed rock and roll masterpiece. Originally written for Guitar World some time between 1996-98 for the Producers column. 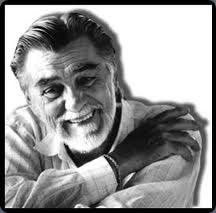 Tom Dowd was one of the greatest producers of popular, 20th century American music –working with everyone from Charles Mingus, the Drifters , Ray Charles and Aretha Franklin to the Allman Brothers, Lynyrd Skynyrd and Cream. He was also a great guy and a brilliant raconteur, who loved to entertain with tales from his long and storied career. I interviewed him many times for many stories. I wrote the following for Guitar World over a decade ago, for the Producers column. One of my favorite memories of my career was sneaking into the Rock and Roll Hall of Fame induction ceremony at the Waldorf Astoria the year the Allman Brothers were admitted — a major coup that required grapefruit cajones, by the way, but that’s another story. After making the break from the press room into the hall, I drifted around and ended up at one of the Allmans tables, with Kirk West, my buddy and an ABB manager. He was tickled to see me, couldn’t believe I had breached the security, and gave me an invisible ink hand stamp under the table which made me legit. The night was coming to a close and I found myself next to Tom Dowd. He filled up our wine glasses with a bottle of red on the table. As Neil Young and others took the stage for a jam, Tom regaled me with the story of how Otis Redding wrote “sitting on the Dock of the Bay” as his first song after Steve Cropper had given him an open tuned guitar. He told me all about the song and the recording process of it — he produced that, too. R.I.P. Tom, you were a gentleman. 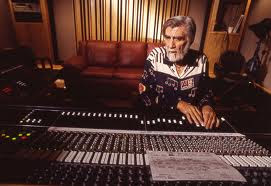 Tom Dowd began his career as a house engineer and producer for Atlantic Records, recording classic sides by Ray Charles, Aretha Franklin, Otis Redding, John Coltrane and others. But for all his contributions to the worlds of jazz and r&b, Dowd was to make his biggest mark in rock, most notably working with Cream and, later, Eric Clapton, and the Allman Brothers Band, a relationship which began with the group’s second album, Idlewild South (Capricorn, 1970), and continues to this day. So he was uniquely qualified to bring together Clapton and Duane Allman, a casual introduction which led to the creation of one of rock’s undisputed masterpieces, Layla and And Other Assorted Love Songs(Polydor, 1970). “I was working with the Allman Brothers on Idlewild Southwhen I got a call from Robert Stigwood saying that Eric would like to record and asking if I could fit him in my schedule,” recalls Dowd. “Of course I said I’d be delighted. It became a lengthy conversation and as I usually didn’t take calls while in session the Allmans had all wandered in wondering what the hell was going on. I put the phone down and said to Duane, ‘You have to excuse me, that was Eric Clapton’s manager. They want to come here and record,’ and he said, ‘You mean this guy?’ and plays me an Eric solo note for note. I said, ‘That’s the one’ and he goes, ‘I got to meet that guy. You got to let me know when he’s gonna be here. I’d love to come by and just watch him. Do you think that would be possible?’ And I told him I was sure it would be fine, and he should call me and we’d work it out. “Now I knew the two of them personally and they were both low-key, beautiful human beings and wonderful musicians, so I thought, ‘This is gonna be fun.’ Sure enough, Saturday afternoon, we record for a few hours, then head out to the limos Eric had waiting and go down to the Convention Center, where the Allman Brothers are playing. They snuck us in behind the photographer’s barricade, sitting on the floor with our backs to the audience, right in front of the stage. 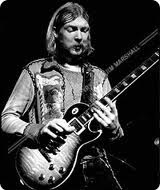 Duane’s in the middle of a solo, when he opens his eyes, looks down, sees Eric and stops playing cold, in shock. Dickey starts playing to cover until Duane regains his equilibrium, and then he sees Eric and he freezes too. That’s how big Eric was to them. Drummer Jim Gordon, who played the coda’s piano part is credited with writing it as well, a fact which has been disputed over the years. Dowd says that no one ever explicitly told him who wrote the music, but Gordon played it beautifully, in one take. “When I set up, I expected Bobby Whitlock to play the piano, but [drummer] Jim Gordon played it. I can’t say whether or not he wrote it, but he had it mastered; that part was in the end of his fingers. Duane’s guitar part on that coda is just absolutely intense and, of course, I was absolutely wrong about not being able to make the new part fit. We spliced it right in and it made the song. I knew immediately that we had something really, really special –as anyone would have. The guitar playing over that last section of Layla would have to be the most over-rated and out of tune waffle that has ever been committed to tape. Stir the pot! I like it, but you are nuts. I find much of Clapton's work to be horribly overrated, but I'm of the "Duane can do no wrong" camp. I'm no expert on Duane but the little I've heard is a million times better than what he did on Layla. I just can't understand why no one turned on the BS detector when that was recorded. Ya, if I were you I stay anonymous also. You may want to rethink whether your “hearing is fine”. Thanks, and I agree. I have a very cool ABB project coming any day now. Please stay tuned. The reviews are coming in… Another good review in — Booklist.